I have seen that cast-on in a few places, but am not sure if it has a consensus name either. 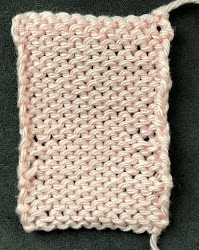 I have noticed it only works for ribbing greater than k1, p1 (at least for me). Despite trying many cast-ons, I'm yet to find a method that looks good in 1x1 ribbing that I can execute in a reasonable time and at a reasonable tension. I have seen many other knitters achieve good results with tubular cast-ons, but my attempts were tight and messy (not sure how I managed both).